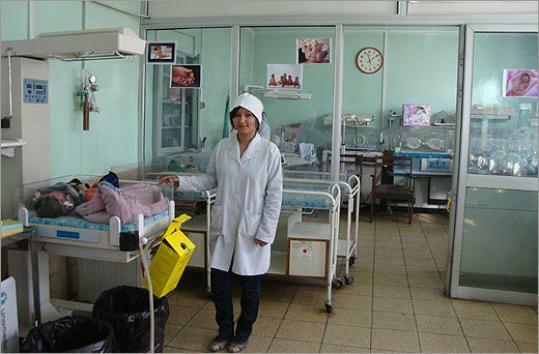 Nagina Khudaynazar, a Mount Holyoke College student from South Boston, working at the Malalai Maternity Hospital in Kabul, Afghanistan. It says something about this day and media age that in Afghanistan, millions know about a pathetic hillbilly preacher from Florida named Terry Jones but hardly anybody knows about a terrific college kid from Boston named Nagina Khudaynazar. Jones, who grew up in a swamp, used his freedom to burn a Koran and incite murder in Afghanistan. Nagina, who grew up in Afghanistan and the projects of South Boston, used her freedom to get an education and go back to Afghanistan to save lives. Nagina was 9 years old when the Taliban swept into her hometown, Mazar-e-Sharif, in the far north of Afghanistan. Her father stamped visas for the government, a job that marked him for death. So he loaded his wife and five children on a bus bound for the border. On the way, the Taliban stopped the bus and Nagina’s father was forced off at gunpoint. They suspected that he worked for the government, and that usually meant a summary execution. But the gunman’s attention was drawn to Nagina and her younger siblings, crying in the bus windows, and they let her father go. After the bus trip, Nagina and her family walked for days and weeks. “I remember climbing mountains,’’ she says. The reward for their Herculean trek was a squalid refugee camp in Pakistan. Her father couldn’t find a job, so they tried Turkmenistan. They put their name on a list and got lucky: refugee status for the United States. They lived in Chelsea for a year before settling in the West Broadway projects in Southie. Nagina arrived in Boston in 2001, at the age of 12, without a lick of English. Six years later, she was valedictorian of City on a Hill Charter School in Roxbury. Her English, which she polished talking to the old folks at Marian Manor where she served food, is impeccable. She’s now a senior at Mount Holyoke College, majoring in biology. Last year, she received grants from the college’s Weismann Center and the Afghan Girls Financial Assistance Fund for an internship at Malalai Maternity Hospital in Kabul. Even though her last memories of her homeland were traumatic, she wanted to go back. She was supposed to study maternal mortality, but as soon as she got there in December, she got hands-on involved in stemming it. First she was introduced as an American student. Then they called her an American medical student. Then, after she started taking blood pressure, drawing blood, and giving injections and gynecological exams, everybody started calling her Dr. Nagina. As many as 100 babies are delivered every day at Malalai. The Taliban hate the hospital because it shows how preposterous their world view is: it is staffed almost exclusively by women. “It was very inspiring and empowering to see educated Afghan women running a hospital,’’ Nagina said. Seven United Nations workers were the first to die in the riots caused by Terry Jones’s provocation. They died in Mazar-e-Sharif, the city Nagina fled as a girl 13 years ago. Terry Jones, the deluded preacher, is the best recruiter the Taliban ever had. Nagina Khudaynazar, the idealistic student, is the antidote to the Taliban, to ignorance in general. Nagina will graduate from Mount Holyoke next month and hopes to go to medical school. Then she wants to open a clinic in Afghanistan, to help Afghans with family planning and reproductive health. And when she goes back, she’ll be Dr. Nagina, for real.